Administrators can even modify other accounts, changing them to either Standard or Administrator accounts. But if you want to have more control than that — the ability to change an account’s name or password — you need the power of the desktop’s Control Panel. There, you can also create a Guest account, handy for visitors who need a quick trip to the Internet, and nothing more. You can’t change Microsoft accounts with these steps — those account holders must go online to do that — but you can change a Local account. Right-click the Start button in the scree’s bottom-left corner and choose Control Panel from the pop-up menu. If you’re a touchscreen user, hold down your finger on the Start button and tap the words Control Panel from the pop‐up menu. Click to open the Control Panel’s User Accounts category. The Manage Accounts window appears, as shown in the following figure, listing all the accounts on your computer. The Manage Accounts window lets you change the settings of other account holders on the computer. While you’re here, feel free to turn on the Guest account by selecting its name and clicking the Turn On button. 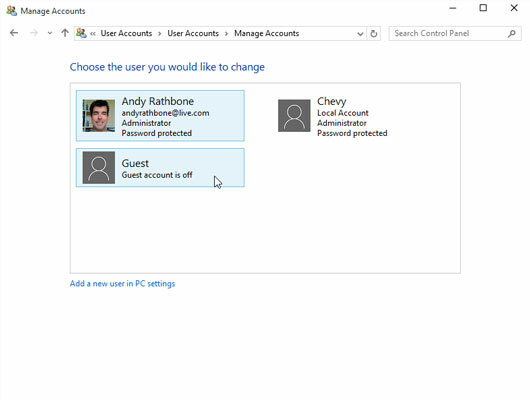 A Guest account provides a handy and safe way to let visitors use your computer — without giving them access to your files, changing your settings, or doing anything that might harm your computer. Change the Account Name: Here’s your chance to correct a misspelled name on an account. Or feel free to jazz up your own account name, changing Jane to Crystal Powers. Set Up Microsoft Family: An Easter egg for parents, Microsoft Family lets you choose the hours that an account holder may access the PC, as well as limit the programs and games the account holder may run. Delete the Account: Don’t choose this option hastily, because deleting somebody’s account also deletes all her files. If you do choose it, also choose the subsequent option that appears, Keep Files. That option places all of that person’s files in a folder on your desktop for safekeeping.